I have had alot of help in the past around Christmas and I am currently in a position that I can help others. Being a Social Media Marketer I have alot of connections with great companies and awesome followers that love helping others. So many families are struggling and it’s my mission to help as many as I possibly can this year. And YOU can help make wishes come true as well. 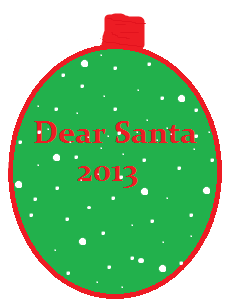 I created a facebook page called, ” Dear Santa, 2013“. Families in need can fill out a wishlist, and I post it onto the wall, excluding their personal information. When we get a sponsor or family that can fulfill any of the wishes, I will write it under the posted wish and send an email to the family that sent the wishlist. Company sponsored gifts won’t be distributed until early December. This is how YOU can help a Family in Need this Holiday Season…. You can sponsor an individual wish, multiple wishes or even a complete family. If you have gently used clothes and/or toys that can be gifted, those items would be great as well. Just make sure they are like new, meaning no stains, rips, broken parts, etc. To get the family as much as possible I would recommend: paypal, gift cards and Wal-Mart Site to Store. This will save you the shipping costs from gifts. If you would rather not hunt for a family to help, you are more than welcome to send paypal or gift cards to me and I will distribute the items myself. Please don’t send me gifts as I don’t want to ship them, the money from shipping can be given to a family in need. You can ship directly to the family if you wish. I will disperse the paypal donations and gift cards in early December. You can also help by spreading the word about, Dear Santa 2013. I would like this to reach as many as possible. If lots of people know about it more families will get help. Please share and pass it around. Let’s make some wishes come true!!! If you want to fulfill a wish or donate to the Christmas Fund, Fill out this Donation Form. Your goodwill will not go unnoticed, you will be publicly thanked for your donations. This is how companies can help a Family in Need this Holiday Season………. If you would simply like to donate funds you can do so above with the Donate button. Please fill out the Donation Form above with any type of donation. You will be publicly thanked with a linkback to your website. Company donations will not be assigned to a family until early December.